Brick Town Talk: Running Lean - LEGO Town, Architecture, Building Tips, Inspiration Ideas, and more! Tinytown, USA - (BTT) Wanting the luxuries of the big city but lacking the space in which to do so, the residents in this town were caught in quite a dilemma. Over the squabbling and bickering in a recent town hall meeting, a voice in the crowd shouted "Why not just make every building half as wide?" and suddenly all was right with the world. 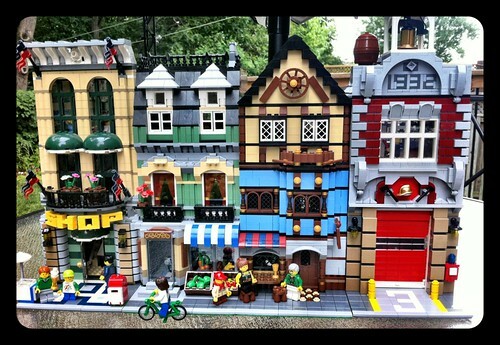 Fantastic Lego Blog I love it and i love the Lego display you have pictured above the luxury lego sets are the best and offer the most realism too keep up the good work BOOKMARKED! Thanks! I'm glad you like the site! My friend Jonathan has done a lot with this blog lately, so I just wanted to him know how pleased I am with his contribution.